The current La Loca, a newly conceived vintage lifestyle and alternative arts magazine, features Jeneda and Clayson Benally, the Blackfire band members who made history with their brother Klee introducing punk rock to the reservations. Wearing sleek, black leather sportswear designed by Cochiti artist Virgil Ortiz, Jeneda and Clayson Benally, the Blackfire band members who made history with their brother Klee introducing punk rock to the rez, stand out on the cover and pages of the current edition of La Loca, a newly conceived vintage lifestyle and alternative arts magazine. In La Loca's Native Americana issue, the Benally siblings and about a dozen other Native artists talk about their art and their culture in the context of American history. Creator Ungelbah Davila calls it "re-Indigenization" and says it's the beginning of an artistic renaissance. Flipping through the pages, classic American images embedded with cultural ones emerge on media ranging from hot rods, motorcycles, vinyl, murals, comic books to fashion. Ronni Jaramillo's Acoma pottery designs adorn a custom-painted Harley Davidson; turquoise earrings and Concho belts accent Blue Bird Pinups' World War II-era dresses, while Jason Garcia, the Tewa Man in Black, pays tribute to the original man in black Johnny Cash with his slicked-back pompadour hairstyle and black shirt. The retro art and voices of Diné tattoo artist Elvis Shirley, Jemez guitarist Gerome Fragua, Jemez make-up artist Dina DeVore, Diné multi-media artist Derrick "Woody" Bitsie and many others come alive on the pages of the Native Americana issue. "Being Diné, this issue is close to my heart," Davila said during an interview in her Albuquerque office at the EFG Creative studios, a graphic arts and design company in Albuquerque. Davila said that she couldn't have started the magazine without help. "I have a great team of writers. It is a blessing to have these people," she said. Davila, who designs, writes and shoots photos for the magazine, said that La Loca fills a void in the publishing world. "I think we have the ability here to have a community publication that provides a voice for people who may not be heard," she said. The magazine is published every other month. The first edition came out in June. Catching up with Jeneda and Clayson while they were in Fairbanks, Alaska last week to find out what they thought about La Loca, the Times heard from Clayson, "It is really opening up doors to youth so they can see they can be whatever they want to be while still working from a cultural context." "I think it is pretty cool to represent Native culture and to set an example," said Quincy Zohnie, a senior at Shiprock High who's looking into colleges. Jessa "Miss Jessadoll" Hoyungowa (Diné/Hopi), president of the Blue Bird Pinups said that the 1940s and 1950s blended together so well that it's hard to distinguish when one ended and the other picked up. The soulful sounds of Sam Cook and B.B. King, Bettie Page and Marilyn Monroe pinup posters, and then the grinding rock-and-roll of Elvis Presley and the undefinable sounds of the man in black, Johnny Cash, meshed together in what's known today as rockabilly. Hoyungowa said the Blue Bird Pinups draw from both decades for their costumes and appearances. "We search through thrift shops whenever we get a chance," she said. In the magazine, the six Blue Bird Pinups take up a full page. Adorned with turquoise jewelry, the Blue Birds are dressed in pencil skirts and winged dresses and skirts. Their hair curls down to their shoulders and they wear the distinctive red lipstick and black, cat-eyed liner of that era. Hoyungowa said that being a Blue Bird Pinup has been a way for her to connect to her grandmother who was about her age back then and dressed much as her character dresses. "I saw the black and white photos," she said. "Anyone who has a strong connection to the grandparents and their ancestry are drawn to rockabilly," Davila explained. So, Davila says that Native youth's connection to those days is very understandable. 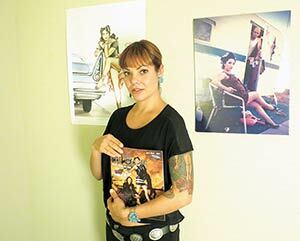 "I can't speak for everyone, but in Albuquerque there are a lot of Natives in the rockabilly scene," she said. One of them is 29-year-old artist Bitsie from Tohatchi, N.M. Working in charcoal and acrylic, Bitsie says he draws inspiration from blues singers like Muddy Waters, Etta James and Sam Cook, who started their careers in the 40s and 50s and went on to become legends. "I paint what I like," Bitsie said. "That's what's wonderful about it. Natives are not sequestered away. It is an interest in history," Davila added. Davila's austere beauty fits with that era when glamour and graciousness was the style. A tattoo stretches elegantly down one arm while 50s straight-cut bangs and inlaid turquoise earrings accent her face. Wearing a silver concho belt, Davila herself presents an artistic blend of traditional, modern and retro. "Ungelbah! I am so proud of her. She is a really good example of utilizing creativity and understanding her cultural foundation and merging the two," Jeneda said. "I thought it would be very neat to show that Native artists are not one dimensional. We are so many things at once," Davila said about starting the magazine. In addition to telling how they became sculptors, painters, fashion designers, models, tattoo artists and much more, the Native artists profiled in the magazine speak out about issues impacting their people and how they are giving back to their communities. Blue Bird Pinup Alyssa Lansing, also known as Alena Trouble (Diné/Apache), said that whenever they perform, the Navajo Code Talkers appreciate them the most. "They say, 'It's good to see Diné women in these fashions, again.' We make them remember those days and appreciate that we dress classy," Lansing said. Hoyungowa said that the retro modeling group brings attention to the needs of children. "We really want to focus on giving back to the community. We want to bring families together," she said. In the story about Sihasin, Clayson and Jeneda also talk about their efforts to support families and communities. Clayson tells how relocation affected his family and his fight to preserve the San Francisco Peaks from pollution. But these aren't the only issues on his or Jeneda's minds. There are many. One of them was the recent reservation-wide horse roundup that sent hundreds of feral Navajo horses to a slaughterhouse. President Ben Shelly recently canceled the roundup due to public outcry. On the phone with the Navajo Times, Clayson said that he joined a demonstration against the roundup. "Livestock is what makes us self-sufficient as a people. We have horses and sheep, that is our bank account. When they are taken from us, we become bankrupt," he said. "There are no boxes," Davila said that when it comes to this new generation of artists. "We are close to a renaissance." In the early part of December, the Blue Bird Pinups will appear at the second annual Blue Christmas fundraising party for children in need. Sihasin won Best Rock Recording at this year's Indian Summer Music Awards in Wisconsin, Jeneda said. On Friday, Nov. 1, Bitsie will present Midnight Train to Memphis, his first solo art exhibit, at Albuquerque art gallery El Chante: Casa de Cultura. "It's going to be a be-bopping good time," Bitsie said. Information: visit lalocamagazine.com, bluebirdpinups.wordpress.com, sihasin.com and find El Chante Casa de Cultura and Bitsie on Facebook.